News Retro Kitchens are Back! The splashy hues and curved lines that typified your grandparents’ first kitchens are making a comeback. These bright, happy styles became popular in the 1950s as kitchens became a social center of the home, and of the newly populated suburbs where neighbors would gather for midday coffee talks. If you’re going all in with a retro renovatio, these styles work well in smaller kitchens and updates to mid-century bungalows. If your current home trends more toward the modern look, here’s how you can still incorporate some splashes of retro style. Appliances in the 1950s spanned the pastel rainbow, with most large appliances available in cheery shades like mint green, sherbet pink and robin egg blue. Rather than allowing one of these colors to overtake your kitchen, choose one smaller appliance for displaying your preferred pastel. A mint green stand mixer or a pretty-in-pink toaster make a great starting point for adding this visual element. Mix in a few additional decorative items in the same shade – kitchen linens, a retro-style wall clock, or a large vase. Are you using your kitchen island as a workspace only? Does the ledge looking out into your family room from your kitchen house picture frames, candles, and decorative items only? Consider transforming these spots from their current use to a functional, counter-style dining space. Look for low-back or no-back stools with padded leather seats in a bright red hue with chrome accents for an authentic diner feel. 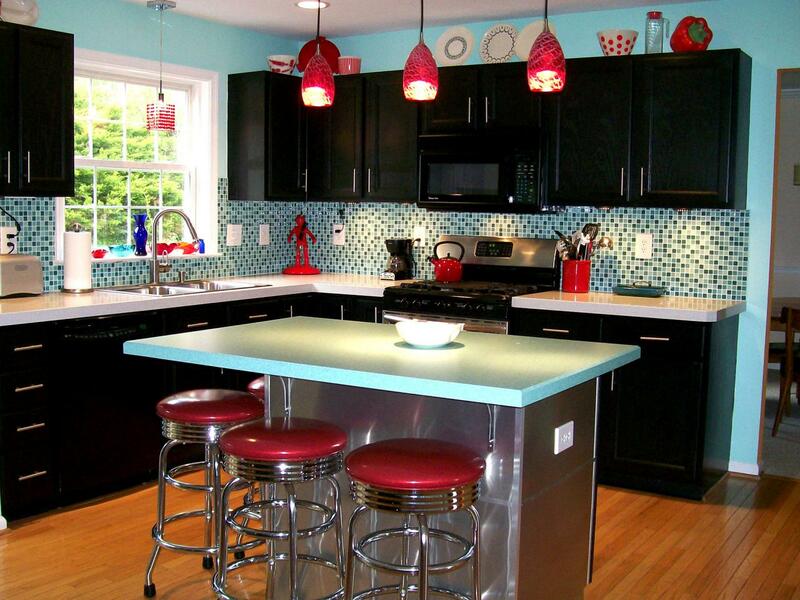 Add additional red accents throughout your kitchen to tie the look together. If you have open-faced shelves in your kitchen, consider filling them with vintage cookbooks! This decorative idea also works well on an unused counter or around a kitchen desk area. Ssearch your local thrift shop or used book store for classic kitchen staples from the top publishers of the 1950s and 1960s, such as Betty Crocker, Better Homes and Gardens, and Southern Living. Face one or two of the more colorful front covers facing the room for a lovely conversation piece and to evoke treasured memories. Ready to try these ideas out in a new kitchen? View our current home listings here!